In Calcutta , the Daniells , Thomas and his nephew Williams were well known. Subho Tagore, particularly promoted them. He had a large collection of their work and they became the main characters in the center of the stage. The Victoria Memorial also housed The Daniells and there were frequent exhibition of their works. The Daniells were a household word.That Kumar was to add the large elephantine folio to the collection of the Memorial , at a much latter date , is another story. Solvyns was practically unknown then in Calcutta. Kumar , discovered some plates of Solvyns in the Catalogue of Bernard Quaritch in late 60’s and added them to his collection. He then started a definitive hunt for Solvyn’s complete works and was able to acquire a set of the Hinddos , printed in Calcutta , some time latter. From here he started promoting Solvyn’s work in a great way. He went out of his way to persuade collectors , friends and aficionados to collect Solvyns. But who is Solvyns? became popular in the early nineteenth century. But more significantly from an historical and social perspective,’s work Solvyns, with its accompanying descriptions, constitutes the first ‘ethnographic survey’ of India or more precisely of Bengal. Moreover, with his ordered, hierarchical portrayal of Hindu castes in Bengal, however problematic this may be, may well Solvyns be the first European to provide a systematic ranking of castes. Yet this contribution has never been recognized. Historians and anthropologists have rarely drawn upon for an Solvyns understanding of society in Bengal in the late eighteenth century. Images : Solvyns -self potrait . 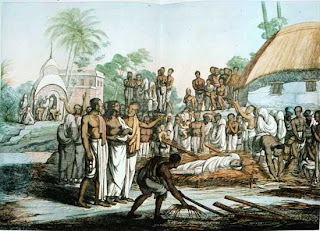 Aquatinted etching of the Hindu rite of 'Sati'. A Sikh . A Boatmen smoking hookah . Sircar. A scene of a market place.